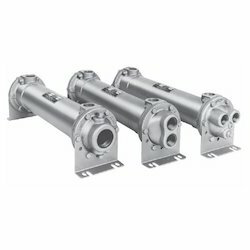 Our product range includes a wide range of shell and tube type oil coolers, air blast oil cooler and air cooled oil cooler. Ours is a reputed organization, which manufacture and export Shell and Tube Type Oil Cooler. A standardized process is followed for their manufacture. These are made available in multiple colors and dimensions as per the requirements of the customers. We are profound manufacturer, exporter and retailer of Air Blast Oil Cooler which are manufactured using high quality materials. 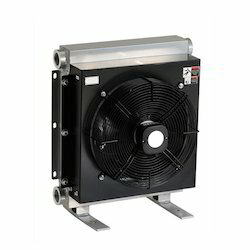 An air blast cooler is a heat exchanger. But, unlike a water heat exchanger which uses water as the cooling medium, an air blast cooler uses free ambient air as its cooling medium. Made up of a radiator fan and motor, oil or water is passed through the radiator and the ambient air is blown over the matrix, transferring the heat from the oil or water to the ambient air. Our organization is indulged in offering a best quality range of Air Cooled Oil Cooler. Made using high-quality components, these coolers are quality-tested and are available to clients in standard and customized specifications. Premier offers Fin & Tube type Oil Coolers to cool Transformer Oil, Lube Oil, Tempering Oil etc. Oil is cooled in tubes using ambient air with the help of fan Et motor. These products can be availed from us nominal market price.